Recently there has been increased interest with people wanting to know who their ancestors were. Sites like ancestry.com have popped up with tools like archives to put together family trees. While this helps to tell you the names of your ancestors and important dates — it doesn't tell you who they really were. This an only really come from the people who actually knew them. It is my desire to have this site be the beginning of a more accurate record of the history of our ancestors by documenting the memories of the people who actually remember them. In time, as a more complete record has been documented, an electronic book for Kindles, iPads, and other readers will be made available to family members to share with their future generations. I ask for immediate participation from Generation 1 and Generation 2 members to document and pass along their factual memories of their grandparents, parents, siblings, spouse, and cousins in the Schultz, Lyon(s), VilleMonte, Castillo, and Francis family tree. While the main web site of Old Hippie’s Roots is where the main articles telling of our ancestors individually are located, the Facebook Page is a place where family can discuss day-to-day family stuff — without all of the other weird Facebook postings on politics and religion, aches and pains, complaints and gripes, etc. This is the appropriate place to share old family photos with a short description, link to ancestor history, photos from a big family event, and any other appropriate discussion of family. The page is organized in chronological order by month, and only displaying a couple of the most recent posts; so if you hadn’t visited the page for a while, be sure to click the More link at the bottom of each month. Please, if you have a Facebook account, look over in the right sidebar for the Facebook RSS for this site — and click LIKE. 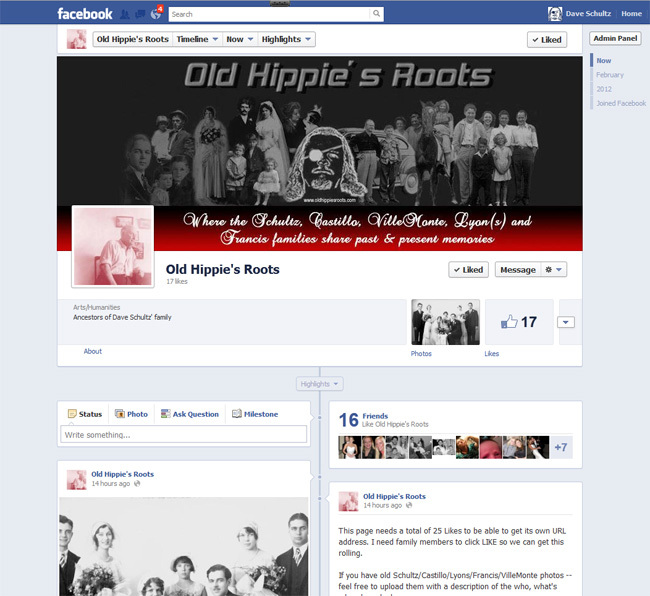 This will get the Family posting on your newsfeed, and get you access to the Family Roots page on Facebook. The page is currently open while we encourage our family members to click LIKE and participate — but at some point it will be closed to the public and private only to the family members who had clicked Like. The Facebook page is NOT intended to replace this web site, the purpose of which is to develop a documented history of all family members. The intention of the Facebook page is to better promote this site, share more history of our ancestors, and more of the day to day family discussions. Please participate if you belong to the Schultz, Castillo, Francis, VilleMonte, or Lyon(s) families. As a matter of explanation of generation references to this site, we refer to the current last living generation (the generation of my parents, aunts and uncles) as Generation 1. Their children (myself, siblings and cousins) as Generation 2, our kids as Generation 3, and their kids as Generation 4. The generation of my Grandparents would be Generation -1, my great-grandparents Generation -2, and so on. The greatest priority of the Old Hippie's Roots Project, is to document and preserve the history of our family. Most important right now, is to encourage the remaining Generation 1 members to document their memories of Generation -2, Generation -1, and other Generation 1 family members. We have few Generation 1 relatives left, and they're our family's last hope for documenting the oldest of personal memories of our ancestry. The next priority for Generation 1s should be to documenting their personal "Life & Times" and their memories of the Generation 2 members no longer with us. If your submission is of a living Generation 1 member, you have the options of having me hold your documented memories from being shared until either you, they, or both have passed on. Less pressing, but still important with the speed of this project moving along — would be for Generation 2 members to document their memories of their grandparents, parents, aunts, uncles, and other family members they have memories of. For those Generation 1 people still with us, we have the first opportunities for our family elders to document their "Life & Times". Here future generations can give their first hand version of their life, in as much or as little detail as they wish. Anything from an Essay to and Autobiography would be appreciated. If you wish, I can hold your "Life and Times" in confidence until your passing. Now is also the time Generation 2 members might start taking the time starting to prepare their "Life & Times" for submission when they turn 65. This is your chance to have the story of your life told in your own words. I have created a discussion forum related to this web site. This is the place to discuss virtually anything or anyone having to do with this web site. It is a semi-private forum. That's to say that the password oldhippiesroots.com must be entered to view the posts. Since the password is published here it should be considered only semi-private. You will have to register to post — but it is very simple. Click the register link in the forums, enter your desired User Name, password, and email address. You then will be sent a confirmation email to that email address. After clicking a link in the email — you're good to go on posting. At present, all posts are moderated — meaning that I will need to approve them before they display, but I'll do it quickly. The reason for this is that I want to eliminate Internet Trolls and Spammers from posting in our forum. I would like to suggest family members using a User Name that readily identifies them to the rest of us. This all is really very easy — but if you have any questions or problems — contact me and I'll help. The absolute best way to submit your memory of and ancestor, or a "Life & Times" memory is in a Word document. One of the best benefits of Word is the spelling and grammar help. Submissions will not be edited, so it is best to take advantage of the tools offered by Word. If this isn't possible, contact me, and we'll figure out what arrangement works best for you. The main purpose of this ancestry site is to help future generations better understand who their ancestors were. Most times we have very pleasant memories of our ancestors, occasionally some of the memories are not so pleasant. We would like to pass along to future generations the facts, and not allow emotions to distort the facts to be either overly fluffy — or overly bitter. Since we want to be historically accurate — we don't want to distort history with the intentional omission of important information. Many things considered deep dark family secrets decades ago — are pretty standard operating procedure today. While would not want to slander any of our ancestors, we should wish to be diplomatically accurate in telling their life story. Piecing together the family history of the Schultz, Lyon(s), VilleMonte, Castillo, and Francis families can be greatly helped with a few family members volunteering to help me collect this information. Please contact me if you would like to volunteer to help. The focus of this site is on the family trees of the Schultz, Lyon(s), VilleMonte, Castillo, and Francis families. It is beyond the scope of this site to extend to the branches past that. However, if you would like to track other branches of your tree, you are encouraged to do so. Setting up a site like this is actually very easy — and doesn't require a like of computer experience. All you need to do is to register a domain name for your site, find web hosting that automatically installs Word Press, and you're on your way. The experience you gain from doing this can actually be profitable with creating web sites for others. Click here for more detailed information on creating your own web site. If you do set up a site for a different branch of the tree — we should exchange links.